"Just shut up. And Write!" This was the mantra Natalie Goldberg repeated often during a recent seminar on memoir writing held at the Kripalu Yoga Center in Lenox, Massachusetts. Natalie is author of 11 books, including her first: “Writing Down the Bones: Freeing the Writer Within” which has influenced and instructed aspiring writers since its original publication in 1986. Her latest offering, “Old Friend From Far Away: The Practice of Writing Memoir” expands upon those early principles. “Memoir,” she reminds us, “is an exploration in the way we remember. It is a slice of life, not a chronological telling. We write memoir to not to remember, to cling, but to honor and let go.” Throughout the three-day seminar, we were gently (and sometimes not so gently) led to a state of awareness of the gap between who we are and who we think we are. The premise is that a writer . . . writes. It differs from Julia Cameron’s “Artist’s Way” techniques in that it is not intended as therapy, but as simple, basic practice. “You create a structure and then you break that structure.” This releases that raw, uncensored energy from which the truth will unfold. “As a writer, you need only three things,” Natalie says. “Pen, paper and the human mind.” From there, everything is an act of listening. It is a practice as demanding and exacting as any Zen regimen. “Just write. Shut up and write. Let it rip and then get out of the way,” she advises. Each day began by sitting in silent meditation and allowing our breath to refocus the mind. Then, holding that energy, it was time to get to work. We keep our pens moving, we don’t edit or cross out, but keep writing, writing. 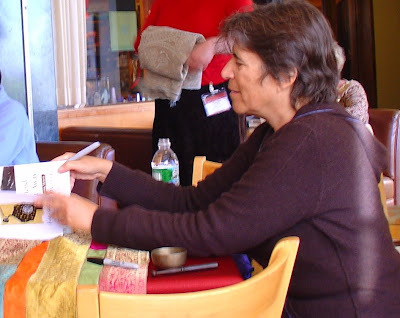 Seeing 130 people enthusiastically filling their notebooks in a series of ten-minute writing “sprints”, heads bowed in complete attention, was a remarkable example of the power of Natalie’s methods. Afterwards, we broke into small groups to read to one other and then aloud to the entire class, practicing the art of non-judgmental listening by recalling key phrases and details that stuck with us – another great way of honing these skills. After the last of these marathon writing exercises, Natalie led us outside where we took off our shoes and slow-walked barefoot through the cold autumn grass – feeling, seeing, listening, matching breath to step, until a natural rhythm occurred. “Writers are always walking, always observing.” At this point, we felt more than transformed, we felt blessed by the community and trust that had grown so quickly between us in just a few short days. The weekend concluded with a quote by Dogen: “If you walk in the mist, you get wet.” Which is to say that you can’t separate yourself from existence. By receiving your life, your voice, it opens the whole world. Thank you, Natalie, for your goodness and your ability to ground us as well as to help us soar! Fabulous interpretation of what sounds like a memorable and opening experience. Hmmm, shut up and write. Maybe I'll try that some time! I am itching with every story ever told under my skin. And I am thrilled to have you coach me as a midwife in birthing this itch. How I long to "Just.Shut.Up" and let the stories rip through me.